I have a new company for review today! It is actually an interesting review because they are products that I have not used before! I was contacted by the Winstonia Store to review two of their products. 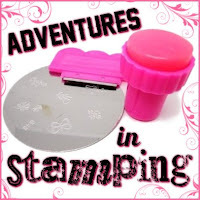 As you might be aware, I happen to own the Winstonia Stamping Plates so I was more than happy to play around with some of their other products! High quality orange wooden stick bundle set from Winstonia! A nail care essential to do your own manicure pedicure at home! These sticks are great for cleaning up around your cuticles! The best part is that they come in three different sizes! You can purchase the sticks through Winstonia for $3.95! The second product was a roll of Metallic Transfer Nail Foil. With over 30 colors available, your creativity and imagination with these Winstonia Metallic Nail Art Foils are endless! These nail foils have a metallic effect and with it's special effect, it gives you the ability to create one of a kind nail art! These nail foils is applied by using foil adhesive or almost dry top coat with no wait time. It is easy to apply and remove, too. More than 30 colors available! Mix match the colors to create galaxy nail art! 9. Viola! Your foil nail art is done! I have never used nail foil before so I was very interested in how this would turn out! I had to do a little research to figure out the best way to use the foil and unfortunately I was missing a key ingredient...nail foil glue! All the videos I watched said to use foil glue, however as you read in the Winstonia instructions it is not necessary. I applied one coat of Milani Pink Express and gave it some time to dry. I waited too long and had to add a top coat to get my nails tacky again. My top coat kept drying too fast and I had to keep adding more to get the foil to transfer. In some spots I pulled off the polish, leaving holes. I do wonder if this would have worked better if I had the foil glue. It probably would have stayed tacky longer making the transfer easier. I might also have gotten more of the foil on my nails. It does create a very neat effect on the nails! You can purchase this foil and many others colors through the Winstonia store for $3.95..and just so you know there are 38 colors to choose from! If you are interested in purchasing these or any other products from Winstonia using the code AGIRLANDHERPOLISH to save 10% until August 31! I highly recommend their stamping plates! Great review on this! Looks like a fun way to spice up your manicure. Oh no, they should have sent you the glue too! Im sure it would have turned out much better if you had all the proper materials. These are so gorgeous I love the textured look they give! I got foil for my nails ages ago and I had no idea you needed to use glue! Puts me off slightly tbh, I hate using glue on my nails.